This is the fantastical story of a boy tormented by nightmares that literally–literally!–become real. Set shortly after the events of The Raven Boys, the students of Aglionby Academy are still on the hunt for a legendary sleeping Welsh king. This time, while we continue to get perspectives from multiple POVs, the story primarily focuses on Ronan Lynch, a troubled and angry 17-year-old who pulls dark objects out of his dreams. But when ley lines running through their sleepy town are awakened, incredible power is unleashed, and none of the boys are prepared for the ordeal that awaits them. I liked The Raven Boys so much that I was nervous going into this one–but I think this book actually surpasses its predecessor, in no small part because of its sharp-eyed character sketches. Adam still worries me. I feel tremendous love and pity for poor Noah. I’m eager to learn more about the entire Lynch clan. And I’m finally starting to feel something for Gansey, as well as to feel the lovely pulse of connection between him and Blue. Add to that a pair of compelling, nuanced antagonists in The Gray Man and one willfully destructive Joseph Kavinsky, and this world is filled with a host of unforgettable players. The author has the ability to create such fierce depth of feeling towards her characters with a single phrase such as “a teddy bear of a boy,” in reference to Ronan’s younger brother Matthew, whom you immediately want to cuddle and protect all at once. I haven’t been able to stop thinking about this book since I finished it. I have so many crazy theories about where this quest will lead, and I desperately want to know what happens to everyone. Aside from thrilling, nightmarish scenes, gorgeous prose, wild revelations, shocking deaths, and clever humor, there are also delicious layers to this novel that you may not fully appreciate until after you’re through, including distinct symbolism (both subtle and powerful), sly hidden jokes, and a deep complexity of thought and plot and emotion. It’s such an interesting meditation on the power of dreams and how hidden desire can influence our actions, from Ronan’s waking nightmares to his mother and father’s unusual relationship to…more yearnings that I won’t spoil for you. I could also write an entire essay about how The Dream Thieves contains one of the most beautiful, heartbreaking kisses in the history of kisses. (Yes. The ENTIRE HISTORY of kisses.) It’s a delicate moment that’s suffused with the breathless wonder of discovery, and it’s all the more poignant because it’s entirely unexpected, and because you are well aware of its context for both parties. Tears are literally welling up in my eyes again as I write this, because that type of longing and sadness pulls so deeply at my heart. Magic was real, magic was real, magic was real. And it runs deep and true through Maggie Stiefvater’s veins. P.S There’s a huge spoiler-tagged discussion going on in that GoodReads thread with theories on what everything MEANS, if you’d care to speculate. I also participated in a rather epic chat with several authors about this book, including Sarah Ockler and RJ Anderson–and let me tell you, there are no better companions to discuss a story like this with than a bunch of smart, passionate authors who are just as excited about the book as you are. One of the mind-blowing takeaways from that discussion: consider the characters as tarot cards. I want to reread this book immediately. !!!!!!!! <—- This is how excited I am to start reading this book. I read The Raven Boys last year and it blew my mind! I wasn't expecting to like it as much as I did but I fell in love. I really can't tell you what was my favorite part or who was my favorite character because I loved everything about it. I remember not liking Adam. I hope he gets better in this book. Great review!!!! I honestly don’t know how I am going to survive the wait for the next book. Those kisses! And Noah.. That just broke my heart. No matter how many times I say it- and I’ve said it a lot already- it will never be able to portray how much I love this series and fell so unexpectedly in love with it. I know you told me that you also loved her book, Shiver, but for me not having liked that one and then loving this.. I just don’t understand. Definitely agree 100% in that everyone needs to get this book! Ohhh! I have this on my TBR list and received an ARC–I have so got to start it!! Great review! You know, this book is a book that leaves you thinking. I love love love the way you wrote about the kiss. It actually made me think of two darling scenes. Wonderful review! Fantastic descriptions of each character and reasonings. Thank you for commenting on my Dream thieves reflection! I agree that this amazing book leaves so much for discussion. THanks for the awesome review! I’m dying to read this series. Great, in depth review! I love the plot already–especially since I’m a fan of romance. I plan to read the book soon so I can find out what happens, thanks for sharing your thoughts! Wow, a sequel passing the first book, I’m even more intrigued! I haven’t read the first book yet so I skimmed your review, but it sounds amazing! My heart sped up at the mention of the amazing, heartbreaking kiss. I WANT THIS NOW. Love the review! I don’t quite understand the tarot card hint and may have to email you or discuss under spoiler tag on GR again. I’m so interested in that chat you had with those authors – actually, my review for TDT is going up in ~30 minutes and I linked to your review because of the wonderful discussion that I’d had/was exposed to there. I always love getting to see when your titles pop up in my feed! So much love for the discussions :). I kind of skimmed your review. I’m HORRIBLE and still haven’t read the first one! I’ve had it since before it released as someone had got me a copy from ALA but I never did manage to read it. Maggie is going to be here in October so I need to be sure to read it before then! It sounds pretty amazing, especially since you loved this 2nd one so much! Ah, but you have plenty of time to catch up before the third book is out! But hah, your time is short if you’re planning on going to that event. It’s so lovely, though, Candace. It’s rather fairy tale like, and as someone who also likes picture books/MG, I think you might enjoy it. I’m so excited for this one, Wendy, since Sam gave this 5 stars as well. I was kind of ambivalent about Adam and Gansey in the prior book so it’s good to know that you started feeling a connection with him in this one. I’m a bit bummed as it appears this one focuses more on Ronan than Blue but I liked him the most from the Aglionby boys so I guess I’ll have to take that. I’m curious about this epic kiss; I’m hoping it’s between the two people I want it to be between. Thank you for the review, I will start the first book as soon as possible! Ahh, so glad to hear from another Maggie lover. :) She really does know how to get under your skin. Wasn’t it beautiful?! I’m so glad you loved it, too! If each book in this series gets better and better, we’re going to be in a helpless heap by the time book 4 comes around. Lovely, lovely review, as usual. I’ve read a series by this author but nothing else, I should try to see how it is. 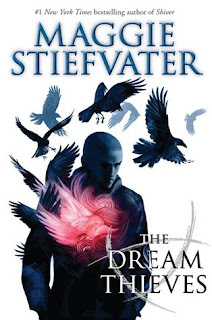 I’ve had mixed thoughts on Stiefvater’s works and The Raven Boys unfortunately didn’t work for me. I am considering picking it up again as I do love her writing and I had little patience the first time round. Ah–I thought RB was a bit confusing at first, and maybe a little slow in the beginning, but this one moves along much more quickly, Mel. I hope you do give this one a shot sometime! And btw, I’ve loved some of her books (like, favorites of all time), but I’ve also had mixed feelings about others, so you’re not alone. Doooo it. :D It’s spectacular. Ohh, the discussion is with everyone on GoodReads who’s read it. Sarah Ockler does join in that a few times, but the chat I was referring to was separate, one that RJ set up on Chatzy! But you can join the GR one after you’ve had a chance to read it. :) I hope you love love love it. YES! Gosh, you and I have very similar thoughts on this one, Wendy! Like you I can now see Gansey as a viable love interest–before he seemed strangely non-sexual. I loved that Ronan was featured so heavily in this book–he is still my fave of all the boys. And NOAH. Smudgy, wonderful Noah. LOVE. And yes to Mr. Gray and Kavinsky being total show stealers in this book! Guess I need to check out that GR thread–I know Lauren sent you our epic email discussion of out theories and guesses at what will happen in this complex series. I’ll have to see how the GR one compares to ours! I really don’t know how Steifvater can map out such a complicated and intricate story–I’m in awe of her! Yeah, I liked Gansey just fine in RB, but I just didn’t really see what all the fuss was about, you know? I think I liked the idea of him more than anything, especially his regard for Adam. But he’s so much more interesting in this book, and I agree that he came off as strangely asexual in a way, hah. RONAN. NOAH! These boys just break my heart. Those two antagonists are so fascinating to me–I could write whole paragraphs on each and every one of them, hah. Do join the discussion if you can, but YES I am excited to read the one you and Lauren and Heidi had, too! Theories, theories…. ‘The Scorpio Races’ left me a little cold, and I haven’t even thought of reading ‘The Raven Boys’ … until now. Should I hurry up and get onto this series? Me thinks I should! Danielle. I am a weird Maggie fan, because I am not as enthused about her books that most people love as I am about the ones most people dislike. In short, SR left me disappointed as well, but this series is fantastic! I would LOVE to hear what you think of it. Thank you, sweetie! DO reread Raven Boys if you can before this one, I wish I had. I’d probably pick up on some clues much faster, hah. Let me know what you think of TDT when you get to it! I am dying to read this book as I loved The Raven Boys-very excited to hear that you think it’s better! Wendy how can you leave me hanging after saying this book contains one of the most beautiful heartbreaking kisses? I knew that this series had a lot going for it, but now? I know I must start this asap. Luckily I had planned to tackle the first book as soon as I came back from a family wedding this weekend. But now all I’ll have is the most beautiful heartbreaking kisses on the brain! So glad that this book lived up to your expectations and more Wendy. I’ll keep you updated with how I get on! Great review! Kidding, kidding. I will be on the lookout for those updates, Jasprit. Strange commenting on your review over here and not on goodreads! I can’t wait for The Dream Thieves and I’m dying to read it even more than I was bored, which I didn’t think was possible! Fantastic review. I love Ronan, and well everyone and I really really want to find out what happens haha. Not long to wait now though. I’ll have to re-read The Raven Boys to appease me a bit closer to the release date! Hey hey, Kate! Oh man, I can’t wait to hear what you think of this book, it is WILD. The story is so intricate, and you will love love love Ronan’s story arc. I wish I’d had a chance to reread RB before reading this, so you’re very lucky you have time to do it. Maggie doesn’t do things halfway, does she? I agree completely with your line about magic running through Maggie’s veins. I felt that way about Lament and parts of Ballad and DEFINITELY in Shiver. She’s an auto-buy YA for me. No, she certainly does not. I think when she goes to the doctor, the nurse must fly off like a fairy after she’s drawn blood. It’s so, so wonderful. *sigh* I love it when we fangirl together, Rachel! GAH! I pre-ordered my copy and I can’t wait to read it. I’m super excited that this book focuses more on Ronan’s story because I find his to be one of the most interesting. And Noah, just thinking about him makes my heart break into tiny little pieces. What Maggie really excels at is creating such a magical atmosphere that feels so very believable. Using such gorgeous, lyrical prose to tell the story might have something to do with that though. It’s nearly impossible to get sucked into it so completely that you find yourself knee-deep on the same journey as the MC’s. Ronan is fascinating–and kind of heartbreaking in this book. There is SO much to him, and so much I couldn’t say in this review, you’ll see what I mean when you’ve had a chance to read it. The whole Lynch clan has amazing secrets. Totally agree on that magical atmosphere–I think she succeeds in that even more in this series than in her previous ones. I totally believe that ravens can be pulled out of dreams. Who are the kissers? I’m dying to know! Reading book one now…. EEEEK! Who are the kissers? I’m dying to know!!! Reading book one now. EEEEEK! Lovely review! I’m so so so excited for this one and hearing all these good things (heartbreaking kiss? what? oh Maggie Stiefvater, you and your feels) is making the wait seem so much longer! Maggie wins at all the feels! I haven’t always loved everything she’s written, but the ones I DO love just bring me to my knees. But you can do it! Just 10 more days! This review is beautiful. Which sounds weird to say, but it is true. You make me want to read this now, but also fear, what it will do to my heart. Oh, our reviews get called beautiful all the time, so feel free. ;) (yeah, my head is 100x a normal human head.) I hope you get a chance to read it soon, Ashley–it’s a lovely, lovely book. An an enormously complicated one. I think you just wrote it. I haven’t started this series yet or read anything by the author before but you were very convincing. DID I? *bats lashes* I hope you give these a shot sometime, Karen. It’s interesting how they’re fantasies, but they’re grounded in an everyday sort of world, almost like magical realism, but with a lot more magic. Wow, this sounds really great! I haven’t read the first one, but have heard great things about it. This is the first review for this one that I have read, but it definitely makes me want to read these books!! Wendy, your review is wonderful. I have this book on my shelve and I will move it up just to experience the story. And if the story contains a epic kissing scene, I WANT TO READ IT! Thank you, darling. I would love to hear what you think of this series! It’s so fantastical and thrilling. Book one is light on the romance, but that one scene in this book alone makes it all worth it. I keep looking for spoilers in this review, because I want to know what happens!! It feels like I’ve been waiting forever. And heartbreaking kiss? WHAT?! Anyway, I’m glad you enjoyed it! Hah, you won’t find any spoilers here. Shoo! Shoo! I hope you’ll swoon over it just as much as I did when you get to read it. That kiss is so amazing and sad and surprising and I adored it. I may have to join in that Goodreads discussion (and reread the book so I get even more of it) because I want to TALK about this one so much. Eff reviewing it. Man, I feel like I need to reread both books before I jump back into that discussion, hah. People have such interesting theories and insightful things to say, and I need to be armed with more details! ME TOO, WENDY. I know we generally tend to agree on most titles, but it’s so WONDERFUL to see you give this book 5 stars too. That kiss was entirely unexpected, wasn’t it? I still can’t stop thinking about it! And Matthew.. I didn’t mention him in my review, but I just loved the slight glimpse we got into his and Ronan’s relationship. I totally want to cuddle and protect him too. This series makes me feel a little bit overwhelmed actually. Like I can’t quite get a grasp on the scale of my feelings for it. I so can’t wait for the next installment! Stunning review as always, hon! Oh, SAM. I originally rated it 4.5, but after 2 days when I couldn’t stop thinking about it (and tearing up!) and marveling over all the intricacies of her plot, I had to round it up. That kiss deserves an entire star in and of itself, hah. I feel the same way about this series now. I liked the first one a lot, but this one just blows everything of the water. SO glad you loved it too! Yay!!! I loved the first book. So unusual and gorgeously written. But I’m having a hard time getting into this one. I think it’s because I can’t really remember what happened in the first book and there’s no real recap of anything (I’ve gotten used to that with UFs). But I’m determined, especially after your review! Maggie wrote a detailed recap of her first book. I found the link through her facebook page. That’s so interesting, Mary, because I actually felt the opposite about the two books–I fell right into this one and just zoomed right along. I hope it picks up for you soon–that kiss alone makes the journey worthwhile!